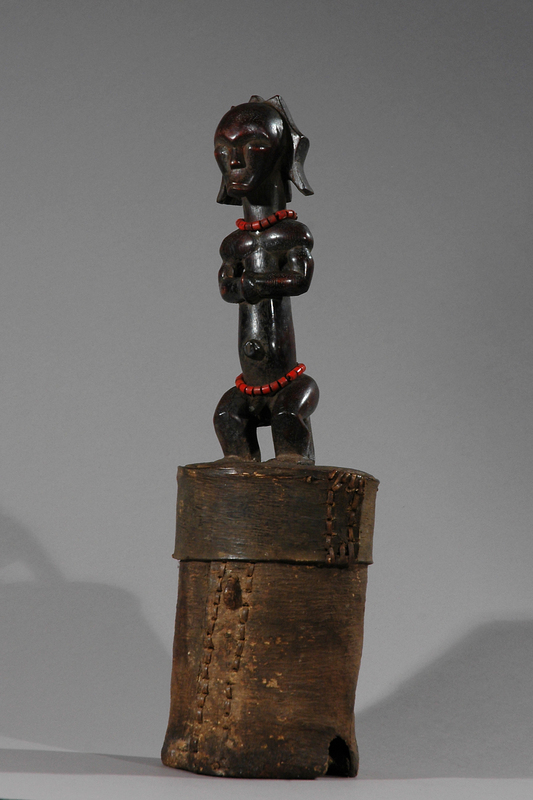 This is a superb and rare Southern Fang male reliquary guardian figure standing on a cylindrical hollowed bark box. 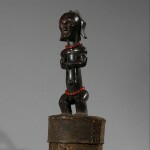 The magical function of the reliquary figures was associated with the bins as they held cranial caps that were brought out at initiations or healing rites. 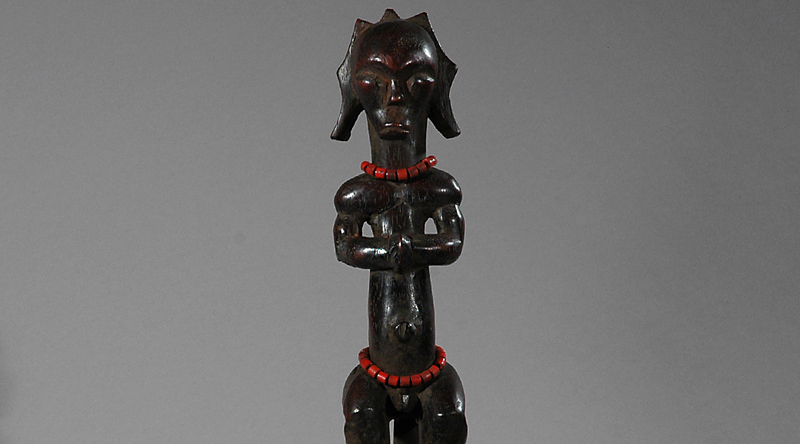 The figure is carved of a hard wood with a varied hard encrusted patina, the artist or atelier who sculpted this figure abstracted the values and lines to create a supremely harmonious form. 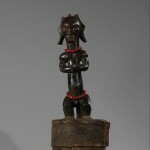 The hands folding on the front shows a dignitary, which is also expressed by the beautiful, red beads encircling his neck and thighs. 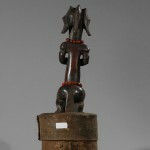 Like many of the Fang figures, this one has a very stylized and quite marvelously abstract form. Also note the very fine and harmonious stitching of both the container and the lid of the container. The territory covered by the Fang ethnic group extends from the region of Yaounde in Cameroon to the Ogooué River in Gabon and includes Equatorial Guinea. The Fang practice the bieri cult, whose aim is to protect themselves from the deceased, to recruit their aid in matters of daily life, and to protect the bones of revered lineage ancestors from malevolent. 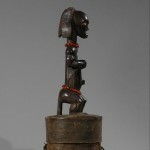 Bieri are reliquary figures placed by the Fang upon their bark boxes to personify the tribal soul, containing the skulls and skeletons of prominent deceased persons. 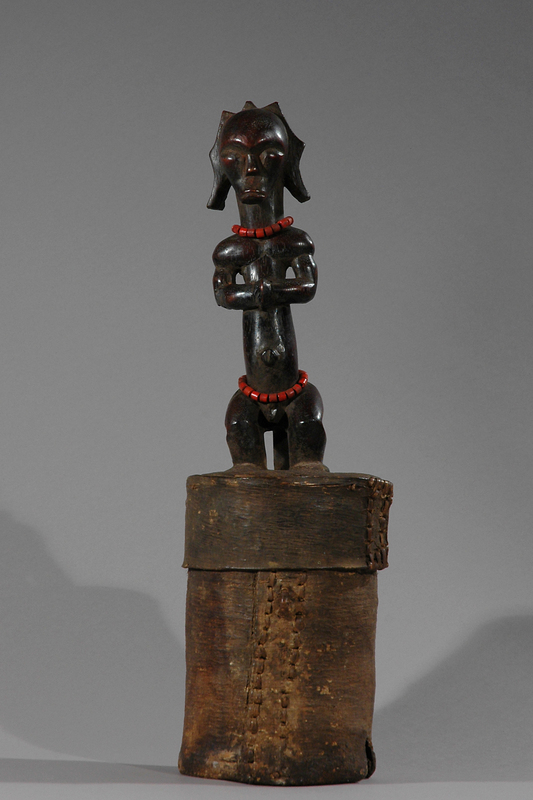 The assemblage of an ancestral reliquary was essential to the establishment of Fang communities during pre-colonial era. Over time, relics associated with its most important members were continually added around the crania of its founder. The bieri also served for therapeutic rituals and, above all, for initiations of young males during the great so festival. Literature: Arts primitifs dans les ateliers d’artistes, Societe des Amis du musee de 1’Homme, Paris 1967, no. 60, p. 59. 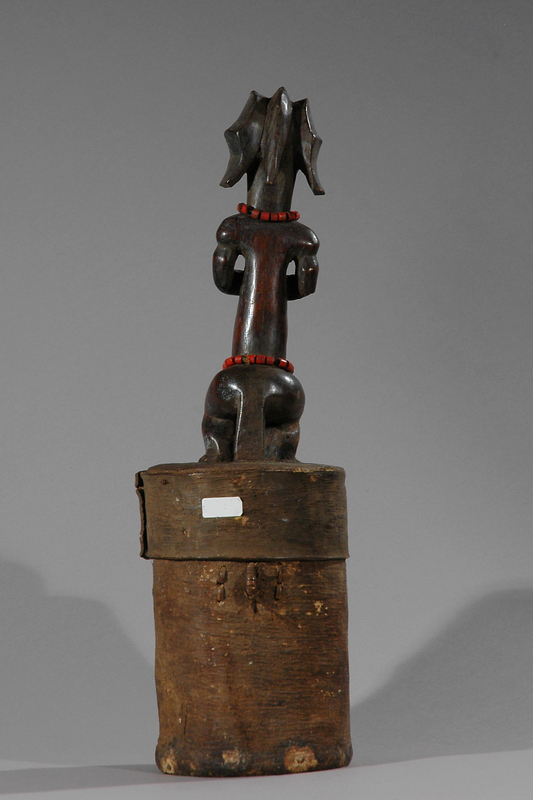 — L. Perrois, Byeri fang — Sculptures d’ancetres en Afrique, Musee de Marseille-Reunion des musees nationaux, 1992, p. 196-197. – Willett, Frank, L’Art ajricain, Thames and Hudson, Paris, 1990, no. 153, p. 162. 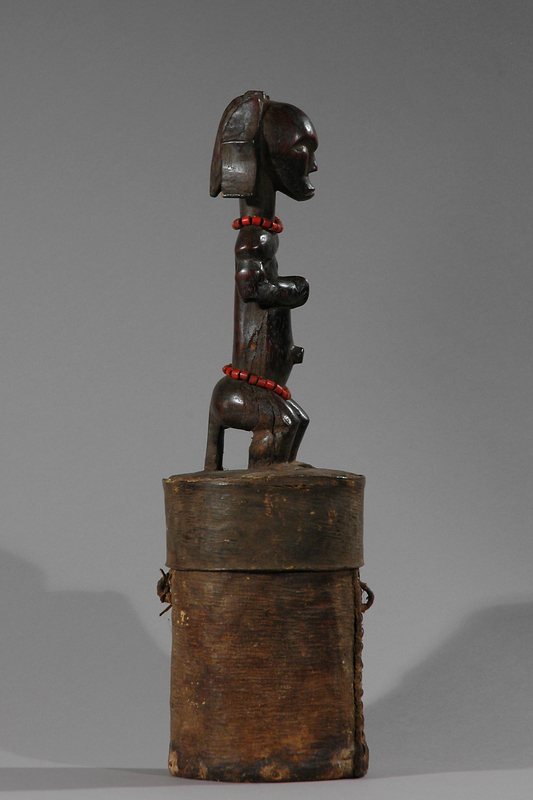 — L. Perrois, La StatuaireJan du Gabon, ORSTOM, Paris 1972, p. 81.